Today I’m back with a review! Erica Stone has just released a new course – Buried Treasure. It probably goes without saying that I went ahead and bought it. I had a quick look through the sales page. It looked like something I could definitely use. The Sales Page – What’s It About? I like the sub headline – The Map to More Money TODAY, TOMORROW, and in the FUTURE from Your Websites! – that is something I could do with! The next section on questions from emails are all things I struggle with – so something that helps out on these points will be great. Working on down there is more about what the course is going to cover. It’s using Google Search Console – this used to be called Webmaster Tools – I wonder when the name changed. It’s about interpreting those reports to show you what changes to make to your site to make it more relevant to searches. Next is a table of contents – which is great to see – it gives you a bit of an insight into what you are getting. The list of 9 things you’ll learn all look like things I need to know more about. It’s a good sales letter to me – no long video and you know what you are going to get and what its going to teach you. There are over the top promises. So the fact it’s going to help me optimize my site for conversions using the numbers I like and it’s from Erica it is no-brainer really. Get the paypal ready! How Did The Buying Process Go. It was just as easy as promised in the sales letters – there were no upsells on the way. I paid through email and was taken back to the warriorplus delivery page. When you click to get your product you get a zipped file for downloading. It has a single 84 page pdf file. Starts off with a disclaimer that I didn’t read, the contents that I’ve already seen in the Sale Letter. Next is a short introduction on Erica and how she likes to use data to help in running businesses in her career before affiliate marketing and how data can help now. There is one report in particular inside Google Search Console. You do need to have added this to your site to be able to get the information. I’ve done that although I’ve used it mostly for checking traffic volumes for keywords rather than digging down into it. Okay we’re going to do things to the report to get to the buried treasure. Sounds intriguing. She then lays out the action plan. I like that it gives a structure to the actions. Next up is information about the report explaining what it is and what each of the items in it are. There is also a link to later in the PDF on how to set it up if you’ve not already added it to the report. There is an interesting comparison between the Google report and rank checker tools and the very important way it differs. Now we’re on to the practical stuff. It’s building a report and there are a lot of steps but there is plenty of screenshots. it does take a little time but going steady you can get through it. It’s one of those tasks where it would have been great to print out the instructions instead I flicked back and forth instead. After doing some more to the report we can see what needs to be done to improve the post. After going through the first keyword I do have a couple of ideas on what I can do with the post that can help it. I need to add a few words of content. There are ideas included as to what you can do depending on what the data shows regarding possibilities of improvement to your post. It is very logical and once set up it’s not too involved as to what is needed to analyze. She does clear this up to say it is money in the next few days or weeks not tomorrow. Again this is using the spreadsheet you’ve already created. It all makes sense and is easy to do with you coming up with an action plan. There are good suggestions here as to what you can do depending on what you can see on your post and from the data you’ve got. Using the same data and sorting and filtering is how you find other ideas for content for your site. Again it is straightforward and clever at the same time. I’ve got some actions from the first post that I’ve analyzed following along to the steps. Then it’s on how to go forward and organize your work to be as efficient and effective as possible. And that the end of the course. There are a list of here courses which are all very good in particular Extreme Review if you are starting out or want to know how to write in depth valuable reviews. So how is it overall. Erica Stone’s Buried Treasure is as I expected a well put together course. 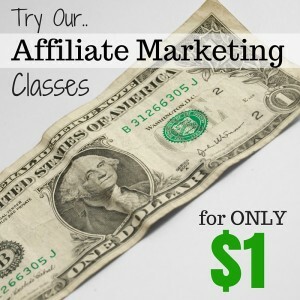 It is for people who already have a site and are getting traffic. You have to have traffic coming to the site to be able to have data to be able to analyze. If you don’t like spreadsheets and looking through numbers you might think this is not for you. But I think you’d be wrong because of the benefits and there isn’t anything too hard to do. It’s made very simple ad isn’t too boring. Erica’s instructions are step by step. It can be a little annoying following along but it is easy. Then you are left with just a few bits of data to look at and analyze. It helps to direct you on what changes to make to your content today to improve the performance of your posts and also for tomorrow. It’s very insightful and full of commonsense. 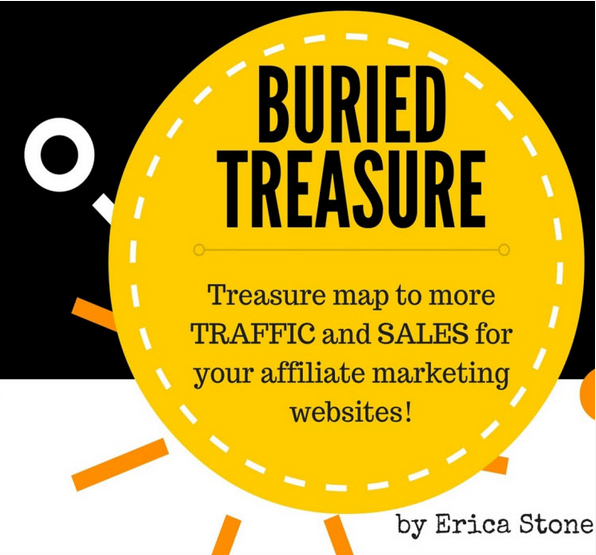 I’m very impressed by Erica Stone’s Buried Treasure for it’s clear directions and its simple to do method to show you how to improve the earning potential of your site just using the current traffic you are getting to your site.